Dinosaur Comics - February 1st, 2017 - awesome fun times! February 1st, 2017: Guess what happened 14 years ago, THIS VERY DAY?? 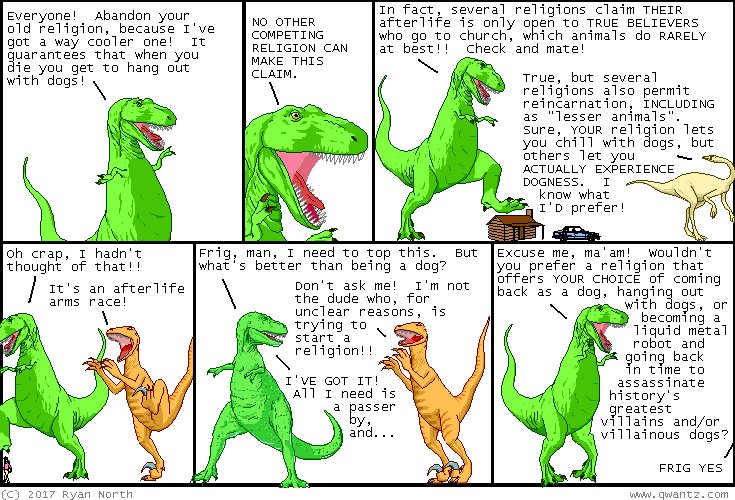 If you guessed "well Ryan, is it that you put the very first Dinosaur Comic online, sharing publicly what you'd spent just one weekend working on, having no idea that you would be able to get more than a few days of material out of these pictures before you'd have to change them, and in doing so change the course of your life from 'probably gonna be a computer programmer I guess' to 'guy who writes comics and does crazy things on the internet'", then you guessed correctly! WELL DONE!